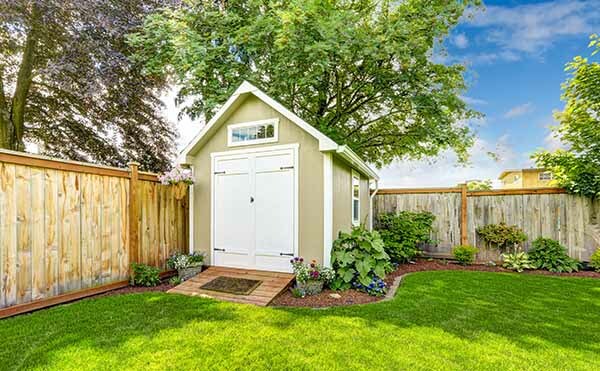 Sheds in the backyard don’t just hold the lawn mower and rakes anymore. With people’s need for extra space, a home office or even a playhouse, a new hot trend called “shedquarters” has been sweeping the country over the last few years. Realtors like them because they can bring extra money in for the home sellers. Just those few extra 200 to 400 square feet in your backyard can give the space you need for any activity or room you want. But Mike Speciale has been building these shedquarters the past seven years with more than 50 completed so far. He is owner of Sett Studio in Austin, Texas, and the majority of his customers want them for their office or art studio outside of the home. “Austin is a very entrepreneurial city. There are loopholes with city jurisdictions with these sheds. You can add space to your home at a reasonable price,” he says. More than 43 percent of employed Americans spent at least some time working remotely, according to a Gallup survey this year. Thirty-one percent of those said they work remotely four to five days a week, which grew from only 24 percent in 2012. So, many of them are looking for a quiet, secluded area on their property, where they won’t be distracted. All age groups are buying shedquarters, mostly the middle to upper class, Speciale adds. It can be a family who doesn’t want to remodel the inside of the house because mom has decided to start up a home business. A shed just a few feet away from the back deck becomes a better and less expensive choice. It can be someone with a flourishing hobby who needs a spot outside of the house to make their craft beer or pottery or wooden benches. The options seem endless. How much do shedquarters cost? Some people just buy shed kits at their big box stores or from companies that offer the materials and instructions. Those can run from a few thousand dollars up to $10,000, depending on the size. Speciale says the average cost for his custom-designed and built shedquarters run $25,000 and up. But he tries to emulate the style, materials and color of the house it will be sitting behind for a more conducive look. How big can shedquarters be? In Austin, Speciale says he can’t build them more than 16.5 feet tall. Every area will have its own stipulations of height and length. Click to see refinance rates. What is the resale value of a house with a shedquarter in the backyard? Although Speciale is not a realtor, he says that each of the buildings add value. Shedquarters give extra square footage, which most always adds value to the selling price. It’s like an addition that comes along with the house. Sometimes, people do take their shedquarter with them when they move since many of them are portable structures. Speciale and his team work with a lot of realtors, especially with the custom homes they build. They also build a lot of spec homes. For the open houses, they sometimes throw in a backyard studio for staging to entice potential buyers that this is a possibility for more square footage. “Realtors know they have that in their back pocket when it comes to negotiation time,” he says. What can shedquarters include inside? In Austin, Speciale cannot include any plumbing because of ordinances. But he can add electricity with heating and air conditioning. Sett Studio combines energy-efficient and sustainable materials for its designs. “Every city will have its own regulations and rules,” he says. As for materials, flooring and walls, it’s up to the owner and the circumstances of what the space will be used for. And the climates in which the shed will be placed can make a difference, too, in what type of materials will be used. Previous story Whatever Happened To Mortgages With One Percent Down?